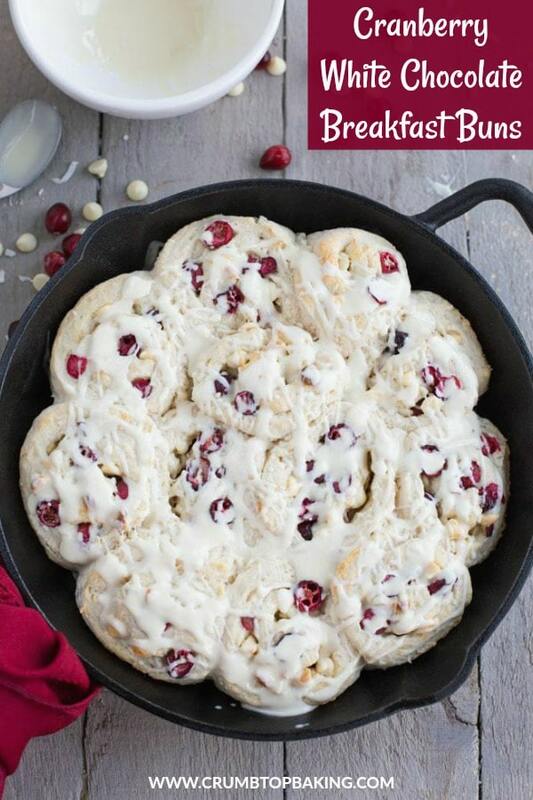 It’s decadent recipe day at Crumb Top Baking, so say hello to these Cranberry White Chocolate Breakfast Buns! Your Friday morning breakfast treat is waiting for you! I know, another cranberry recipe! The second one this week. I almost have as many cranberry recipes on the blog as I do pumpkin recipes! What can I say? 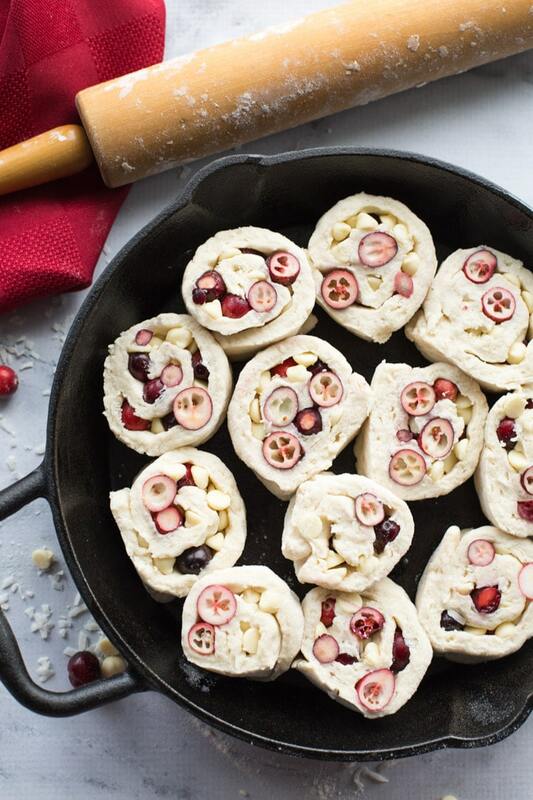 Cranberries are delicious, and so perfect for sweet or savory recipes! Plus, they are super festive. Just look at these buns! They remind me of a cozy, snowy Christmas morning! Cranberries aside, today’s recipe is truly something different for me to share with you guys. 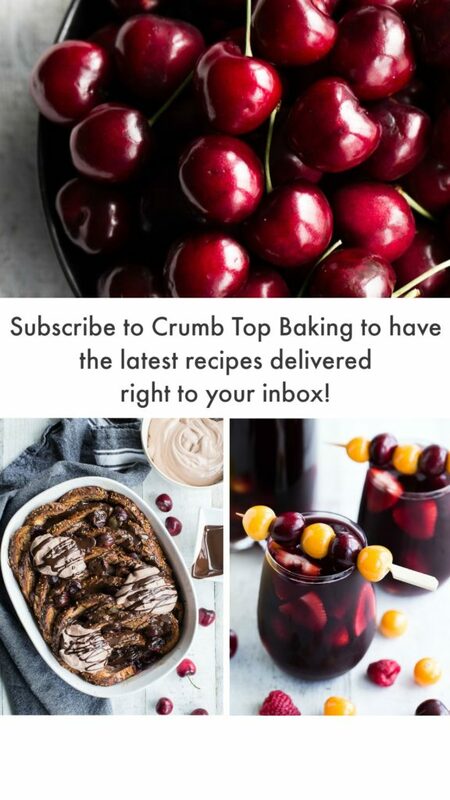 You may have noticed that the tag line for Crumb Top Baking is clean eats and decadent treats. And while I tend to incorporate a decadent touch to a lot of my clean eating dessert and cookie recipes, I’ve yet to share a full on decadent treat. This recipe for Cranberry White Chocolate Breakfast Buns is actually a variation of my mother’s recipe for raisin tea buns. I’m pretty sure ‘tea bun’ is a Newfoundland thing. Am I right? Does anyone else call them tea buns? You probably know them more as tea biscuits? In any case, I made a few tweaks to my mother’s recipe, including the addition of cranberries and white chocolate. (We’ll just save the raisins for another recipe ;). 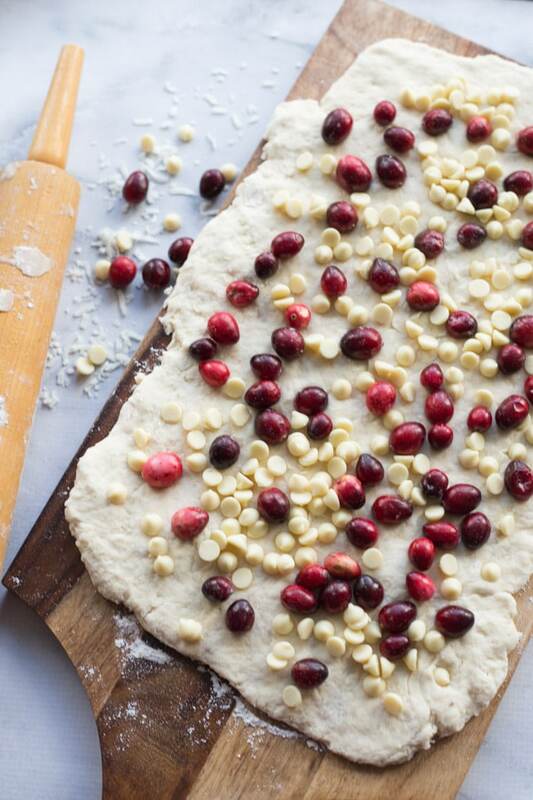 And, instead of cutting the dough into round biscuits, I rolled out the dough and sprinkled on the cranberries and white chocolate chips. Then rolled the dough into a log and cut it into 12 pieces. So the buns looked more like cinnamon rolls. And to finish them off, I melted some more white chocolate and drizzled it over the top. Totally decadent! But totally appropriate for the holidays, don’t ya think?! 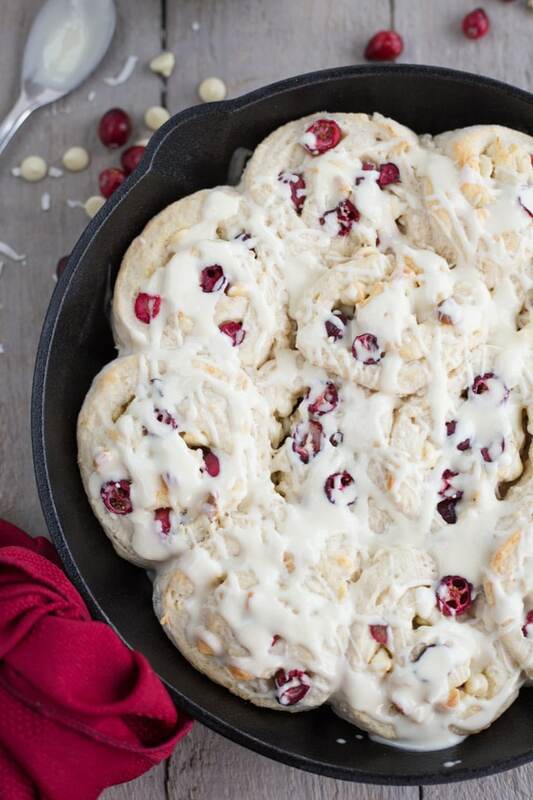 If you want to make these Cranberry White Chocolate Breakfast Buns for your holiday brunch but need to save a little time the morning of, you can always make them ahead of time. And you can do this in two different ways! You can bake these buns the night before and leave them in the skillet overnight (covered, of course). Then, in the morning, melt the white chocolate and drizzle over the buns. So the buns will have the ooey, gooey, warm factor! If you want hot, out-of-the-oven buns, you can make the dough the night before and even arrange the buns in the skillet. Just cover and refrigerate overnight and bake in the morning. While I’ve made the dough the night before and baked in the morning, I prefer to make and bake right away. The dough doesn’t rise and expand quite as much if it is refrigerated overnight. 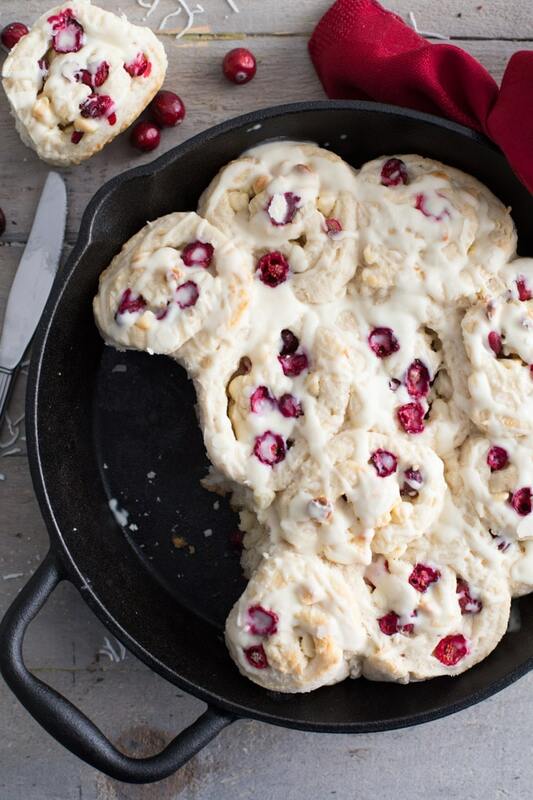 I hope you add these Cranberry White Chocolate Breakfast Buns to your Christmas baking list! Let me know if you give them a try! I would love to hear about it or see some pics. Just tag @crumbtopbaking on Instagram so I’ll see your photos! Happy weekend folks! Hope it’s filled with Christmas decorating and baking! 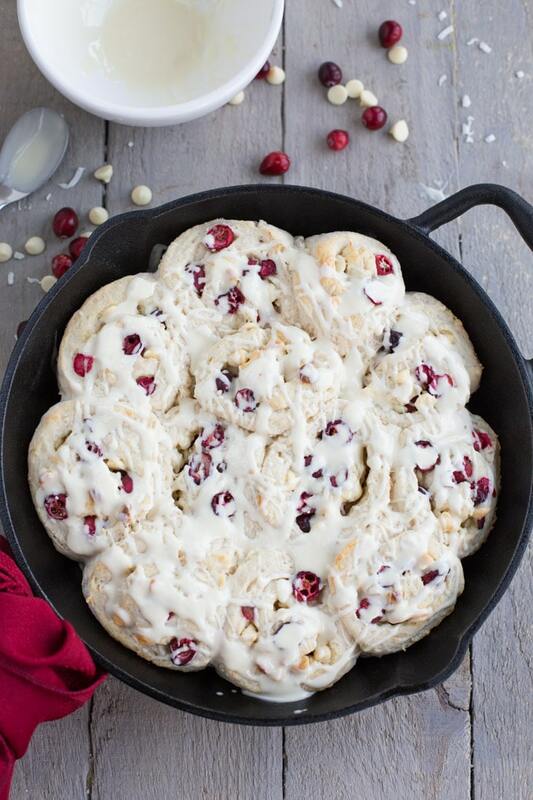 Cranberries, white chocolate and coconut come together in these Cranberry White Chocolate Breakfast Buns to make the perfect decadent treat for your holiday gathering or brunch. They can also be made the night before, so you can save time and have fresh buns in the morning! Pre-heat the oven to 425 degrees and grease a 10″ cast iron skillet. (Or you can line the skillet with parchment paper). In a large mixing bowl, combine the 2 cups of flour, sugar, baking powder and salt. Using an electric mixer on medium speed, gradually add in the cubes of butter and mix until the flour/butter mixture is fine and crumbly. This could take about 4-5 minutes. Add the coconut and mix until just combined. Do not over mix. Keeping the mixer on a low speed, slowly pour the milk into the flour/butter mixture. Just as a sticky dough starts to form, fold out the dough onto a well-floured surface and add the remaining 1/2 cup of flour. Knead the dough until the flour is incorporated and the dough becomes a bit firmer and a little less sticky. Using a rolling pin, roll out the dough into a large rectangle (about 15″ long, 10″ wide and 1/4″ thick). As you’re doing this, you may need to use additional flour for the work surface and the rolling pin. 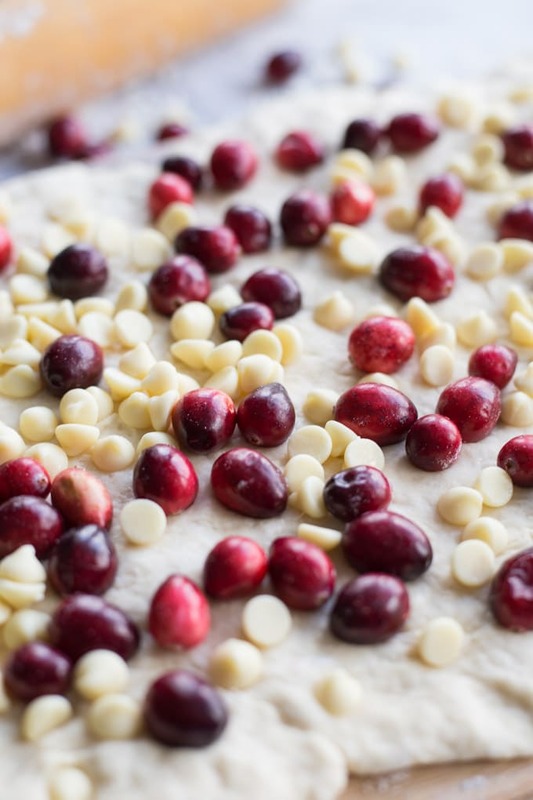 Once rolled out, add the cranberries and the 1/2 cup of white chocolate chips to the top of the dough, making sure they are evenly distributed. From the long edge, roll the dough into a log, folding the ends once it’s rolled to ensure the filling does not come out. Cut into 12 even pieces and arrange in a single layer in the prepared skillet. Bake for approximately 20 minutes, or until the buns have risen and expanded, and start to brown slightly on top. Do not over-bake as they will burn on the bottom. Remove the buns from the oven and let them cool for a few minutes. In a small microwavable bowl, add the remaining 1/3 cup of white chocolate chips and the coconut oil. Microwave for 15 second intervals until the chocolate is melted. This should take about 4 intervals (or 60 seconds). Be sure to stir in between intervals to prevent the chocolate from burning. Drizzle the white chocolate over the buns. Serve warm, or let cool in the skillet and transfer to an airtight container. Store on the counter and enjoy within 3-4 days. You can also freeze these buns for later enjoyment. I like using an electric mixer to crumble the butter into the flour, but you can also do this by using a handheld pastry cutter and massaging the butter into the flour mixture using your hands. These buns can also be prepared in advance. You can make and bake these the night before and leave them in the skillet overnight (covered and on the counter). Then, in the morning, melt the white chocolate and drizzle over the buns. If you want hot, out-of-the-oven buns, you can make the dough the night before, roll into a log, cut into pieces and arrange in the skillet. Just cover and refrigerate overnight and bake in the morning. These look so yummy Leanne!! 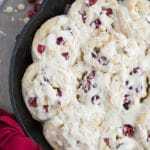 I think cranberry and white chocolate is just the perfect combo – I love that you tweaked your Mom’s recipe!! Mom’s have the best recipes 🙂 Cheers to the weekend! Thanks Katherine! 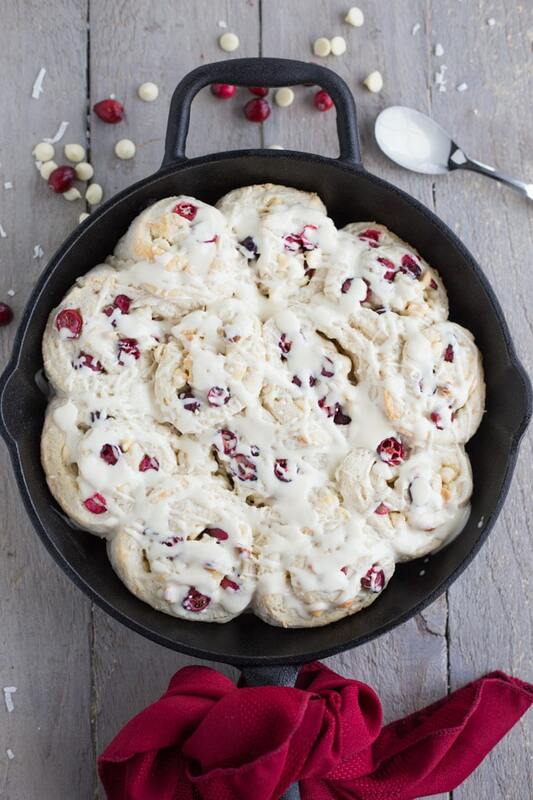 Cranberry and white chocolate is definitely a great combo, especially in these buttery buns! And totally agree! Moms have the best recipes. Enjoy the rest of your weekend! Can it be any better than having such palatable breakfast, Leanne?! Can I use some other kind of milk? Hi Agness! You can definitely use another kind of milk. I’ve made these buns with almond milk, coconut almond milk and full-fat canned coconut milk. They all turned out well. It’s a pretty adaptable recipe! Hope you get a chance to make them!